A fundraising campaign has been launched to light up a Bristol cemetery with candles, in a Mexican Day of the Dead-style celebration. George Grace wants to place thousands of candles and flowers in the graveyard of St Paul's, Bedminster on 2 November. Día de Muertos, or Day of the Dead, is traditionally held in Central and South America on that date every year. Mr Grace said the Light the Night event would help to "put death and dying in a more positive light". 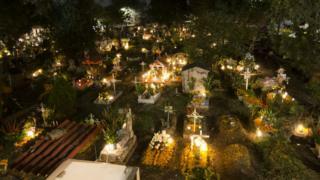 Day of the Dead is a time when families honour deceased loved ones in the belief their souls return to be with them. Some of the celebrations involve people honouring their deceased relatives with candles and floral tributes in cemeteries. Similar celebrations - All Souls' Day and All Saints' Day - are also held at the beginning of November in some European countries. Mr Grace, from Bishopston, said he got the idea after witnessing "completely unique" All Saints' Day graveyard scenes when he lived in Poland 20 years ago. "It was an incredibly beautiful experience, a little bit magical and maybe a little bit mystical. "I'm not religious, but if I've come close to a spiritual experience that would be it." The Rev Canon Nick Hay said he welcomed the idea, which was "not just for religious people". "A lot of people are spiritual and they want to do something that's a bit contemplative, reflective and to remember the people they love." Mr Grace said he hoped to raise about £2,000 to help pay for the event.